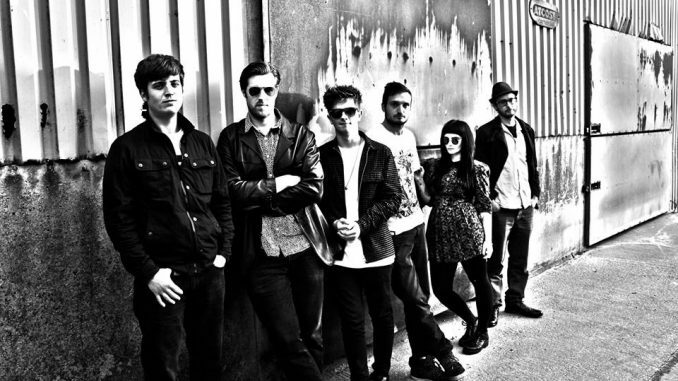 What began as a modest, yet ambitious studio project, The Pinstripe Pigeon Band quickly developed into a seven-strong pop force releasing 5 well-received EPs throughout 2013/14. Their latest material showcases intelligent sophisti-pop, electronica, funkadelia and anthemic rock. I recently caught up with Ben and Kirsty from the band for a chat. Ben – I don’t really know, I did come up with it. Years and years ago when I used to do demos, I would put them on my iPod, instead of putting my name on as the artist which I thought looked stupid, I would put the Pinstripe Pigeon Orchestra on. I have no idea where the name came from. I suggested Pinstripe Pigeon Orchestra when we started the band, which someone said “ That’s stupid because we are not an orchestra”, So I said “Pinstripe Pigeon Band?” And they agreed, It was better than anything else we had. It’s easy if you’re Googling for us as well. How long has the band been together? Ben – We started as a recording project probably just over 2 years ago and we played out first live gig about 6 months after that. So you initially set out to be a studio based project? 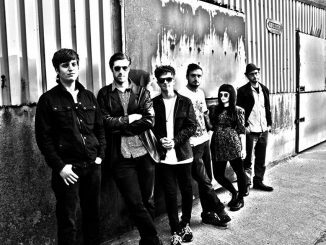 Ben – Yes that’s right, we were in a band before called the Empire State and myself and Gaz, who is the drummer in that band decided to carry on just as a recording project and bring different singers and musicians in. What basically happened is the core of that band stayed together and Kirsty, who we knew anyway as a friend came along and sang and we haven’t got rid of her. Kirsty – I refused to leave, I wouldn’t let them take anyone else after that. I got possessive and didn’t like them having other singers, they had to stick with me. Ben – So yeah it’s strange it’s gone from that to being a proper band, with a set line up. Ben – In this particular band Gaz as a producer is really into Daft Punk, for me as a songwriter I’m into Jackson Browne, Paul Simon the Beatles, people like that, really good song writers. Also I’m into experimental music and beat driven groove music as well, I try and combine those 2 things. Do all band members contribute to the song writing? Ben – It varies from song to song really. The majority of them usually start with me and Gaz messing about with something and then everyone else will come in and contribute. There’s a song we’ve got on the new EP called ‘I Sleep Cos It’s Easy’ , and me and Gaz didn’t write anything on it, it was Andrew and Kirsty who wrote that one. Kirsty – The problem with me is I can’t write the music first so I write lyrics and a melody, then go to them and expect them to work backwards (laughs) I’m not quite as prolific as them yet, but I’m getting there. It’s as if everything and everyone is allowed to have their say. It’s pretty cool, we all get involved. Does everyone feel confident presenting musical ideas to the rest of the band? Ben – Yeah I think so , well I’d hope so. Kirsty will send me stuff and I’ll send her stuff. I don’t think Dave our bassist ever sent me a song ever in his life, you never know he might have a beautiful singing voice. The band is very prolific, you have released 5 EPs in the past 2 years, do you constantly record and write? Ben – Yeah we don’t stop, we’ve got our own little studio set up. When we started as a recording set up that was always the idea. Over the last 6 months we have probably become a little more selective with our output, we used to record 5 sings and put them out. What we tend to do is record 15- 20 songs and then we will decide which ones work together thematically and musically and focus the eps in a bit more. The new one ‘Sound Asleep’, there is more of a lyrical theme, musically we tried to blend it better. The last ones were little mini jukeboxes I thought, the styles varied greatly. Kirsty – Because we have the facilities to do it and everybody has so many ideas we can keep going and putting it out there, but like Ben says we are pulling back a bit about putting everything out there. There’s part of me that wants to release everything, eventually you want to try and find a bigger audience and part of that is getting more focussed on what you are doing. Will you continue releasing EPS rather than albums? Ben – Yeah I think so for the most part, the next plan is to release another EP called ‘Wide Awake’, the 2 EPS will form an album between them, it’s to be broken into 2 half’s. I don’t think we will release an album for the foreseeable future. We find it to difficult to decide what songs would go in an album. Are you getting a good response from your live shows? Ben – Yes it’s been fantastic! The crowds just seem to keep growing for us every gig. We are based in Preston and to be able to go to places like Manchester and have people coming out to see us there, it’s great. We are really looking forward to spreading our wings out further afield and seeing if the effect carries on elsewhere. What is your preferred format to listen to music on between vinyl, download or cd? I prefer to listen to vinyl, I prefer to release on CD cos it’s cheap and they look nice. I would prefer to release all our stuff on vinyl. The best thing about CD’s is you can carry a load of them and sell them at gigs. I don’t really download much stuff, I stream stuff but only like if I’m at a party and people are around. When I’m listening to music on my own I tend to listen on vinyl. Kirsty – it’s definitely, definitely harder, we’ve already said about how many CD’s we have done, we make our own videos we look after our social media, we do everything and we put so much time into it, you have to now. You have to show that you are willing to put in that hard work, people aren’t going to invest in you unless you have already got something there. They don’t look at a band and think there is a chance of something, they don’t want to take that risk anymore. Ben – You almost have to be the finished article before someone takes you on. It’s strange, it’s gone so quickly from bands getting snapped up and getting huge advances and all that kind of stuff to completely the opposite. From when I picked up a guitar when I was 14 to now it’s unrecognisable. Kirsty – Those bands who were coming through a couple of summers ago, they were the next big thing and everything was put into them and now you don’t hear about them. A friend of mine knew a band ( I won’t mention any names ) they were getting somewhere and. And now they have been dropped and they are back in their old jobs, and that’s that. You never know what’s going to happen. I’m just glad that we can record our own music and keep putting it out without having to have label backing at this point, it would be good but it’s nice that we can do it for ourselves. We still get to do the most important thing. Kirsty – this isn’t early cool but I have Little Mix – ‘Black Magic’, it’s a really good song, I listen to it everyday on the way to work and it makes me feel happy and I have a good day because of it. Ben – I’ve been listening to a lot of Chic and disco compilations, but really what I’ve been listening to a lot if I’m being honest is Bruce Springsteen bootlegs that I’ve been obsessively ordering off the internet. It’s musical crack for me, I can’t stop now. Also the last Manic Street Preachers album is really good, ‘Futurology’, it’s an amalgamation of what they have been over the last ten years. What is next for the Pinstripe Pigeon Band ? Ben – We are hoping do do some gigs around the country later in the year between September to December so watch out for those. Then we will have another EP out which is ‘Wide Awake’. You can buy The Pinstripe Pigeon Band’s latest release ‘Sound Asleep EP’ HERE.